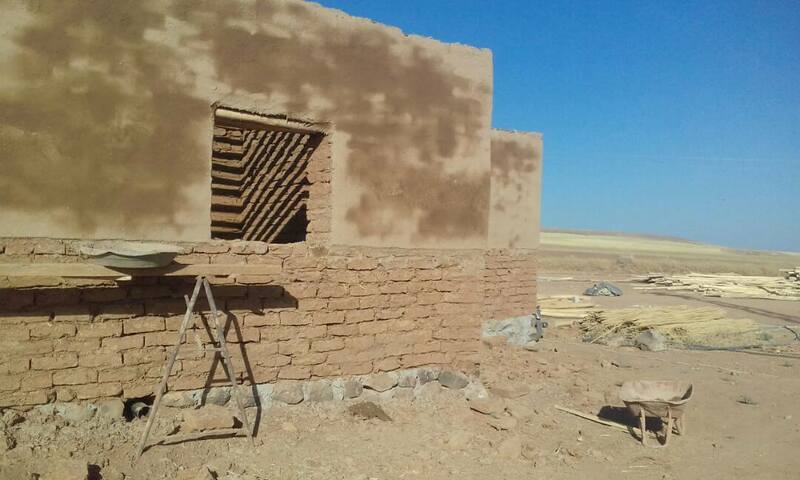 Jinwar – Free Women’s Village, Rojava, facebook page. In this three part essay, Susan Thomson explores violence and political struggle in moving image and film work shown by AEMI (Artists’ And Experimental Moving Image) in Ireland, at the ICA (Institute of Contemporary Arts) in London and at other international film festivals. For the third and last part, Revolution, she focuses on In formation III, a series of talks, films, performances and events on contemporary political issues which took place at the ICA. The ecological gardening of the women’s village is continuing and the first flowers and fruits are growing. There are plants of pepper, pumpkin, tomatoes, aubergine, potatoes etc. These are the seedlings we planted in spring. The Garden gives us many fruits. In society women are often seen as without force and weak. With the construction of the village of free women #JINWAR we are going to change this backward opinion and we will create personalities of free women. Already with the results of the construction we showed this. 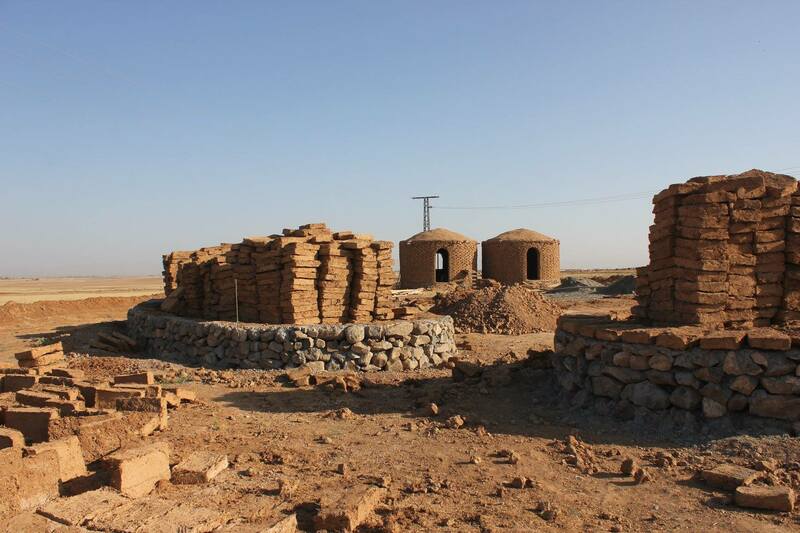 Women build their own houses. They live according to their own planning and fruits of their work. For this we are proud and are continuing our work with success. They may cut a flower but they will not stop Spring from coming. ‘In formation III’ is a series of talks, films, performances and events which focus on contemporary political issues – Black Lives Matter, crip, trans and non-binary themes, trying to encourage and problematise inter-subjective discourse, attempting to go beyond usual modes of thought, instigating creative collisions of different discourses. I attended a number of these events and certainly found that they had, for the most part, an alchemical quality. Denise Ferreira da Silva’s talk, ‘Blacklight’ (she is Professor and Director of The Social Justice Institute Chair at British Columbia University) mixed particle physics, Kant, Maths and Marx – she showed equations from Marx about labour and profit, and applied these to black lives under slavery where wages were of course nil, proposing instead ethical equations of value – she invoked the concept of ‘Blacklight’, another wavelength outside of the range of human vision in a version of a kind of Afro-futurism, and proposed a recentering of subjectivity around this instead of the accepted value of whiteness as the universal measure. This would value instead black lives equally, and see from another perspective. One could almost feel particles of different discourses colliding in this call to recentre the world, in this remix of the Black Lives Matter movement. Bright green jewels and other minerals in the artwork slides projected overhead spoke of the ‘shine’, the glitter-image of colonial appropriation. It was a heady mix and attracted a racially diverse and interesting looking crowd. A film event I attended at ‘In formation III’ was National Narrative (2018) directed by Grégoire Breil, its title, Roman National translated from the French as ‘National Narrative’ rather than ‘National Novel’. This film, previously premiering at the Cinéma du Réel film festival, is composed entirely from a Facebook or Instagram-style French social media site called Periscope. It begins by presenting its protagonists, through selfie-style videos or vlogs, before building up to a relatively conventional dramatic climax in the shape of the Nice terror attacks in 2016. This film, unlike the other events of ‘In formation III’ however, leaves me feeling empty. It is the non-stop racism, the endless narcissism of people presenting themselves sexually for the camera, the sexism and homophobia of the scrolling comments. Still, the film begins to acquire a dramatic, if dark momentum in the unintentional documenting of a national incident, the terror attack by the driver of a lorry on a celebrating crowd in Nice. The ‘likes’, love hearts which rise like balloons or fireworks, which had previously looked relatively meaningless, begin to acquire more gravitas. The film does though pose the question of how to represent terror, especially now that so many movies are being made about this. Clint Eastwood’s film 15:17 to Paris (2018) uses the men themselves who fought off and foiled the terrorist attack on a trans-European train, creating a docu-fiction in the process. Paul Greengrass’s 22 JULY (2018) competes with Erik Poppe’s Utøya (2018) to represent the 2011 Norwegian massacre. The representation in National Narrative is real time, documentary ‘archival’ footage from multiple points of view, rough, amateur, connected, networked. 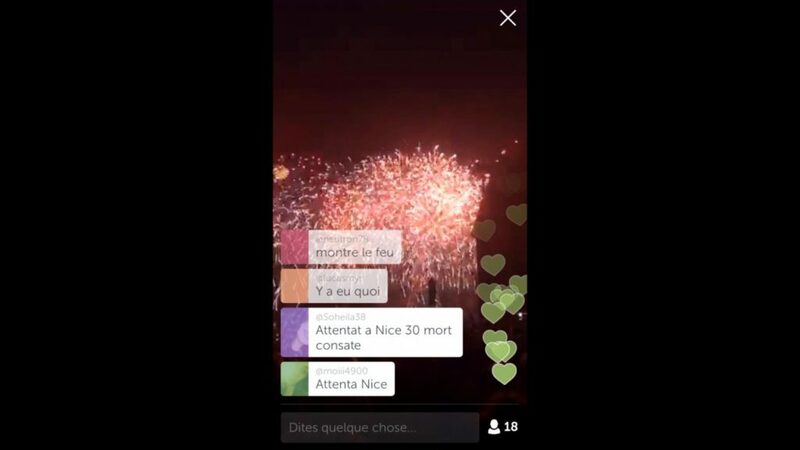 Mobile phone video technology and social media accurately portray the spontaneity, fear, and sense of information coming in piecemeal, as people continue to party in Paris and parts of Nice apparently oblivious as the news rolls in and people dismiss it first as ‘fake news’, before the body count begins to rise. 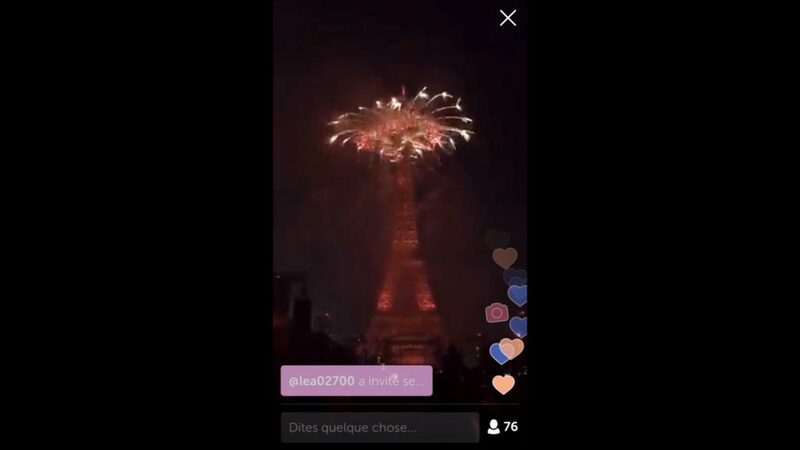 It is Bastille Day, and fireworks go off at the Eiffel Tower, and pixelate into a blur, as people start to become aware of the attack. The most effective scene in the film is a person’s footage as he runs through the streets of Nice, phone screen nearly pitch black, with love hearts (likes) ascending from the bottom right hand corner. People tell the phone’s owner, running around, ‘Don’t be a hero get off the street’, and one begins to wonder about him doing this precisely for social media. But at least there is care in this and other comments at other times beyond the predatory or the derogatory. However, if you google ‘Periscope’ you quickly realise it caused great controversy in 2016 when it was used by a teenager to screen a live suicide, but none of this is overtly critiqued here. National Narrative seems to suggest that this is France: intolerance and terror, occasionally care – it’s a bleak picture. Ultimately though the film itself is more of a presentation rather than critique, however true to the life of the internet it may be, and the problem is that the film doesn’t allow its ‘characters’ to develop beyond the insults thrown at them; instead they remain within the abusive frameworks created for them. The title is an interesting one in terms of who controls the narrative – the official narrative of celebrating Bastille Day, France’s revolutionary history, contrasting both with the terrorists’ attempt to subvert this narrative, to forever taint it with grief at the casualties in Nice, and the self-representing narratives of the vloggers. In contrast to my response to the film, the Director, Grégoire Beil, who was present at the screening, says he found the people funny and then they moved him nearly to tears – he doesn’t say he found them bleak or crass, which makes me question whether or how much it is intended as a critique at all. It certainly does not seem to adequately deal with social media’s own political role, its role in swaying elections or in disseminating propaganda. There is a very good film to be made this way, using social media footage, and during the scenes of the attack in Nice, it comes close at points to something better, but this isn’t ultimately that film. Other recent, politically engaged French films such as L’époque (Young and Alive) (2018), screened at the Dublin French Film Festival, convey something more hopeful and yet edgy. The documentary which follows various young activists in the Nuit Debout movement, has a realtime feel, as if recorded over one night in Paris, and prefigures the ‘gilets jaunes’ in its evocation of a society close to erupting. Or En Guerre (At War) (2018), which depicts workers agitating on hearing of the imminent closure of the car factory in which they work, a film which foregrounds the political action and leaves personal narratives in the background until later in the film. ‘The Rojava Women’s Revolution: Poetry Reading + Live Exchange with Kongra Star’ was the next event I attended in the ‘In formation III’ series at the ICA, and it related to a feminist revolution taking place in the North of Syria, something which rarely if ever appears in mainstream news, as if censored, either consciously or unconsciously. It seemed the task of this particular evening was to undo this missing image and discourse, and so consequently, for me, writing about it extends this restoration. There was a palpable sense of energy in the ICA lecture theatre, a solidarity with those on screen, applause, as the audience waves and cheers, they wave back, some chanting even of slogans at the end of their call, a utopian powerful energy in the room. There was the suggestion amongst the various speakers and from some in the audience too, that there has been something of a conspiracy of silence amongst the mainstream media with regard to this democratic confederalist model and this feminist revolution – that the media have ignored it deliberately, perhaps because this anti-capitalist, feminist movement, grasped in armed struggle, is simply too dangerous a model, for surrounding autocratic, theocratic states – a model which has already drawn radicals from all over the world. The mainstream Western media has not reported that it was the women fighters for example of the YPJ (The Women’s Protection Unit) who led and won the fight for Raqqa, a place where women had previously been bought and sold as slaves by Isis. Why do we not know this? Most people will probably have heard of Anna Campbell however, the young woman from Lewes in Sussex, who lost her life fighting against Isis for the YPJ, when Turkey bombed Afrin in Syria – this young woman who dyed her blond hair black in order to be able to blend in, and fight there. Members of her family were in the audience at the ICA that evening. Mark Campbell, activist and co-chair of the Kurdistan Solidarity Campaign, spoke at some length, and with great emotion, about the fact that the British government seems to have no interest in trying to repatriate the bodies of its citizens who have died fighting against Isis, more concerned in keeping up good relations and its foreign policy interests in Turkey. (Turkey considers the YPJ and YPG to be terrorist groups – the US and the UK do not, and the US has backed them militarily.) Comparisons were also drawn between these international volunteer fighters, and those International Brigades who went to Spain in the 1930s to fight fascism in the Spanish Civil War. Meanwhile, and prior to the Afrin assault, the UK, in yet another act of moral corruption relating to the arms trade, in 2017 signed a deal worth 100 million to develop Turkish fighter jets. After the end of the call, Jaye Griffiths read Rahila Gupta’s ‘Rubáiyát of Rojava’, a journalist’s account of her trip to Rojava, and meeting with Kongra Star. While informative, there was something a little like pouring cold water over the energy that had gone before. While praising certain aspects, the criticality of the poem was concerned by the slogans, the worship of male leader, the imprisoned Abdullah Öcalan, in a feminist collective, the lack of LGBTQ+ acknowledgment within this struggle – that it, like women’s issues in other previous revolutions will be left till later or not at all, (I have read varying reports on LGBTQ inclusivity). She questions the lack of dissent, all the while acknowledging that much larger forces could destroy this fragile enterprise so easily anyway. It added a critical dimension, but perhaps what was needed was another voice or voices. Possibly raising those very same (and other issues) with the women themselves would have been better, rather than after they had disappeared from our screen, when they were effectively silenced and had no right of reply. It felt as if we in London, in the West, had the final word. As if we too, like the accusations being levelled at Western media, found this revolution a little too radical. This revolution that has outlawed forced marriage, child brides, honour killings, polygamy, and has introduced laws against domestic violence, all the while fighting against and beating Isis, doing what few amongst us would be prepared to do, although meanwhile we benefit, survive only because some people in the world are prepared to fight such fascism. 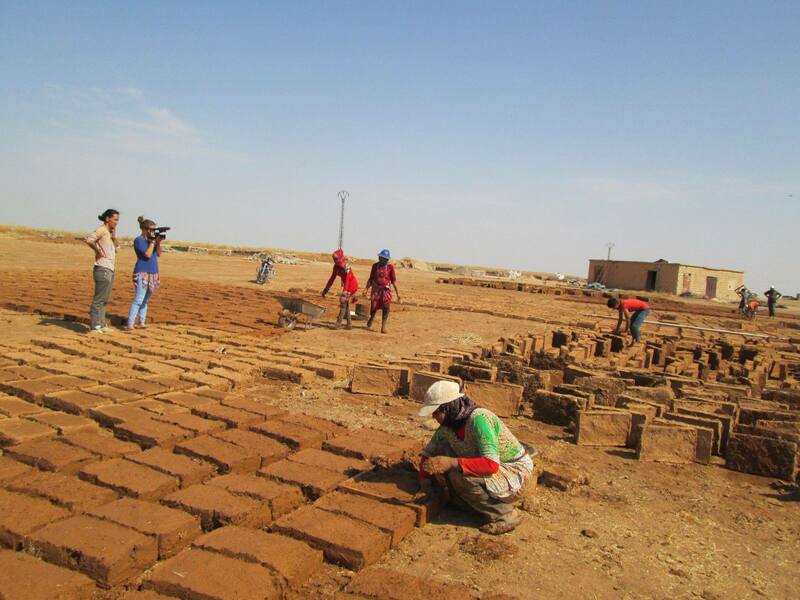 In retrospect, and on further research too into the Rojava Women’s Village and Kongra Star, their emphasis on cooperation and community and optimism, felt at odds with this too. A dialogue would have been more powerful, if the same concerns were tactfully put to the women themselves for a response, while acknowledging the powerful symbol and reality of what they are literally and figuratively building – with kerpîç bricks. However, the event was free and the audience was encouraged to donate what they would normally have spent on such an event, instead to Kongra Star. A Syrian Biennale is slated for 2019. It will be interesting to see if Rojava is explored more fully in this context. At the time of writing, the U.S. is beginning a (initially announced as a full withdrawal but in reality possibly partial) withdrawal of troops from Syria, while other countries such as France have pledged to retain troops until Isis is defeated. There have been Turkish and Syrian troops massing on the Turkish border, and threats issued to Kurds by the Turkish government. The utopian experiment so lovingly articulated that evening seems more precarious than ever: Rojava appears to face a very uncertain future, seeking allies of all stripes. Over the course of this three-part essay, I have looked in depth at Donal Foreman’s The Image You Missed (2018), Chick Strand’s Soft Fiction (1978) and many other moving image and film works, covering a multiplicity of forms of representation. Many of these works have used archival or found images, sometimes creating a distance between the original footage and the ultimate film, and at other times, attempting to create dialogue with the contemporary moment. All are engaged in an attempt to bring stories to light, that are either forgotten – or which have been suppressed or censored in some way by governments, society or the media. While there is a risk of any of these being simply co-opted for ‘edge’ or radicality, the hope is that the issues and the work are strong enough to surmount that, and that the ripple effect of each work will become part of its life force. Women’s movements go from strength to strength globally, and feminist-related art is part of that struggle. That fight is now overtly intersectional, rather than taking whiteness, heteronormativity or Western values as its point of departure. #TimesUp and #MeToo are bringing to light sexual abuse, violence and harassment and other abuses of power across various industries and professions, as well as drawing up targets and quotas for gender pay equality and allowing women and their films and other work to begin to come to the fore. 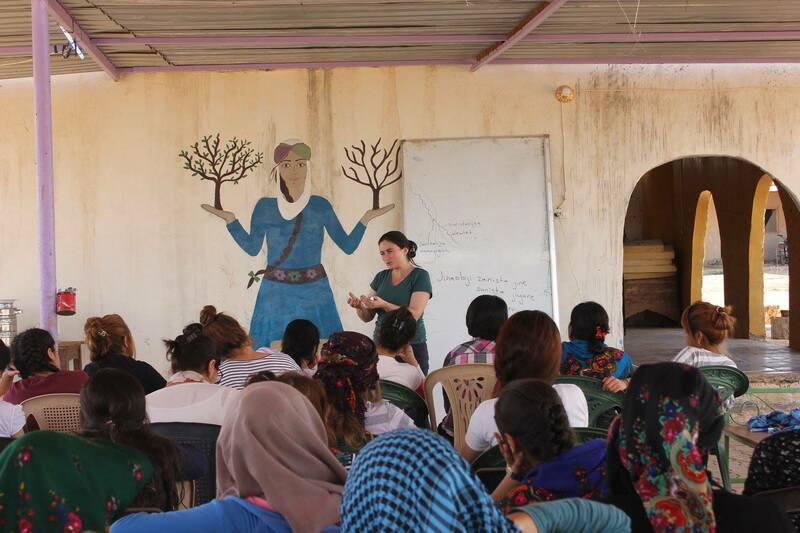 Rojava shows that we in the West have a lot to learn from other forms of non- Western feminism, which we don’t need to embrace whole-sale, and nor do we need to assume are not in some ways superior to our own ways of being. To dare to speak and fight against reactionary and destructive forces within our culture is crucial. Where hate speech is increasingly normalised, other discourses, including artistic discourse, have a role to play. And one only has to look at the banning of Gender Studies in Hungary or the destruction of ancient works of art and architecture in Syria to see the true power and symbolism of art and theory. Sometimes, as in Yvonne Rainer’s work, or the water-damaged films of Dawson City: Frozen Time (2016), the best thing is to wear one’s scars proudly, and find beauty in them. However, restoration in all its forms can be a force for good, and often is, although it risks being overly canonical or commercial when applied to film. Then there are restorations such as Palmyra, in Syria which can also seem to be an exercise in attempted government rebranding and tourism. The Arts frequently fights today for its own self-preservation, damaged or destroyed as it can be through violence, censorship or capitalism. Nonetheless, it still has significant power. Ben Lerner, The Custodians, New Yorker, January 11, 2016. Kate Brown, Berlin’s Cultural Institutions Unite to Fight Far-Right Nationalists in Germany. Chloe Stead Finding the Right Words to Decolonize Art’s Mores, Canons and Practices, Frieze, 23 August 2018.